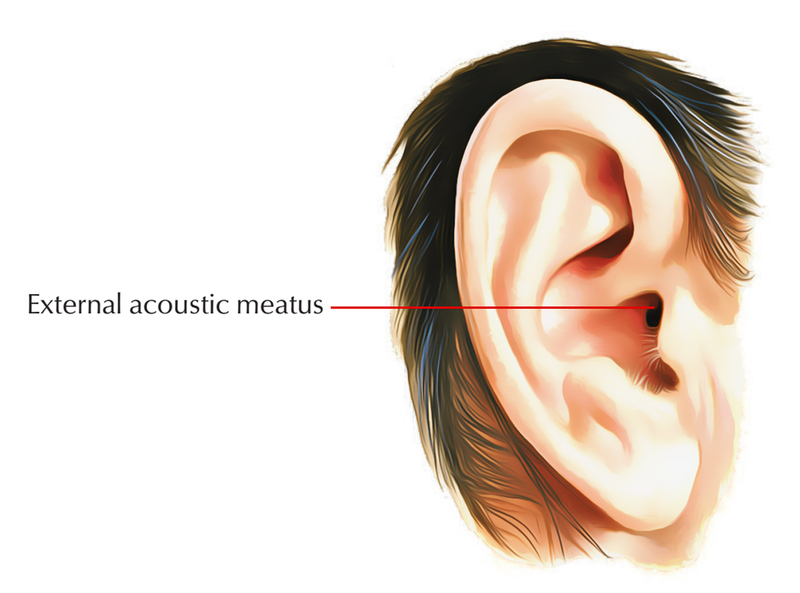 The external auditory meatus a.k.a. external acoustic meatus extends from the base of the concha towards the tympanic membrane and alongside its posterior wall measures nearly 24 millimeters. It has a typical S-shaped course rather than a straight tube shape. So in order to check the tympanic membrane the pinna requires to be pulled upwards, backwards and laterally in order to bring the 2 portions in a symmetrical position. 1. Its outer portion is directed upwards, backwards as well as medially; while its inner part is directed downwards, forwards as well as medially. 2. The external auditory meatus is distributed in 2 portions – cartilaginous and bony. The outer one-third of the meatus that measures approx. 8 millimeters is made by the cartilaginous part. The cartilage of the auricle extends in form of the cartilage. The skin enveloping is thick and consists of hair and glands that secrete ear wax called ceruminous a.k.a. pilosebaceous in the cartilaginous portion. The inner two-third of the external auditory meatus that measures 16 millimeters is made by the bony part. The skin coating is thin as well as continuous with the cuticular layer of the tympanic membrane in the bony part of meatus. It’s without hair and ceruminous glands. The bony meatus has a thinning called isthmus is located nearly 4 mm lateral towards the tympanic membrane. 3. A foramen known as foramen of Huschke is found sometimes given by the anterior wall of bony portion. This foramen is found in kids till the age of 4 years. 4. The bony canal isn’t grown in the newborn and is signified via a tympanic ring of bone. The external auditory meatus is shorter in children as a result and so the deep insertion of ear speculum may damage the tympanic membrane. The progression of external auditory meatus takes place as an ectodermal hollow part of first pharyngeal cleft. It becomes filled up with ectodermal cells and creates a solid mass that is canalized before entrance. From 6 mesodermal tubercles the auricle develops near the external aperture of the first pharyngeal cleft. Atresia of the external auditory meatus arises from the failure of canalization of meatal stopper, while accessory auricles are created by the failure of fusion of tubercles. Roof and anterior wall: Auriculotemporal nerve. Floor and posterior wall: Auricular branch of vagus. A minimal amount of swelling is created from the infection and sores of the external auditory meatus but they can be actually disturbing since the skin liner is firmly fixed towards the underlying cartilage and bone. The furuncles a.k.a. infection of hair follicles grows only in this part since the hairs are limited to the outer part of the meatus. The pinna is stretched upwards, backwards and laterally in adults in order to observe external auditory meatus and tympanic membrane, while it’s drawn downwards as well as backward in babies. This is due to the reason that in babies the bony portion of external auditory meatus isn’t matured and also tympanic membrane is mainly directed downwards. 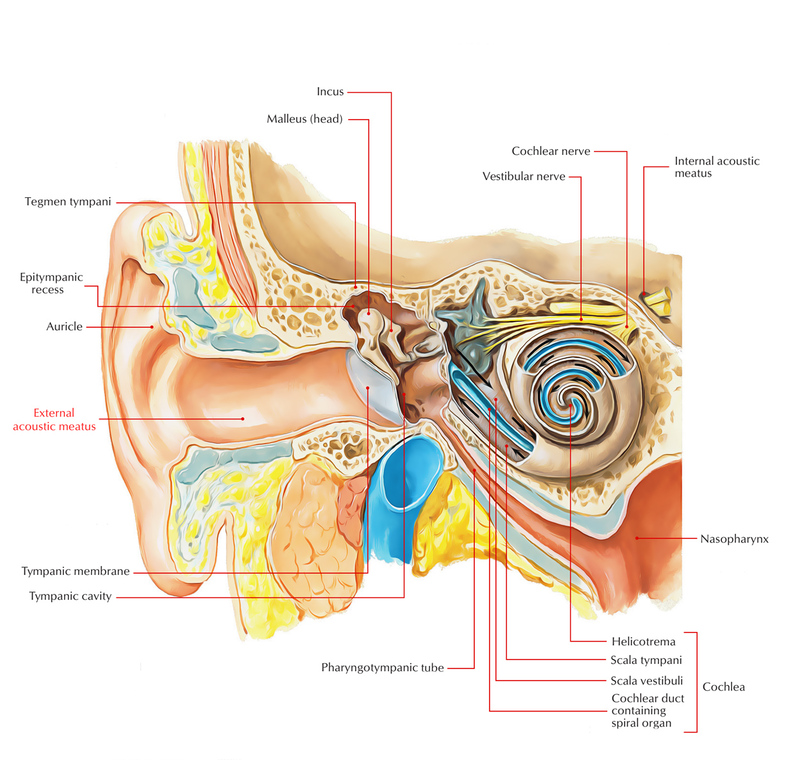 The damage of the lining epithelium of the external auditory meatus from water along with the damage of tympanic membrane by ensnaring the insects is averted by ear wax. The surplus of ear wax obstructing with hearing is eliminated via syringing. During syringing the irritation of auricular division of vagus as a reflex may generate constant cough referred to as ear cough; vomiting and sometimes even death can occur because of rapid cardiac inhibition.